Follow the quickstart guide to set up your project. Replace the app_code value in app/build.gradle with your personal app code. Replace the applicationId in app/build.gradle with the package name that matches your app code. Run the sample on your Android device or emulator. When the application is started, a deep link will be generated using your app code. Click Share to share this deep link to another application. The application checks if it was launched from a deep link. If so, the link data will be displayed under the Receive heading. 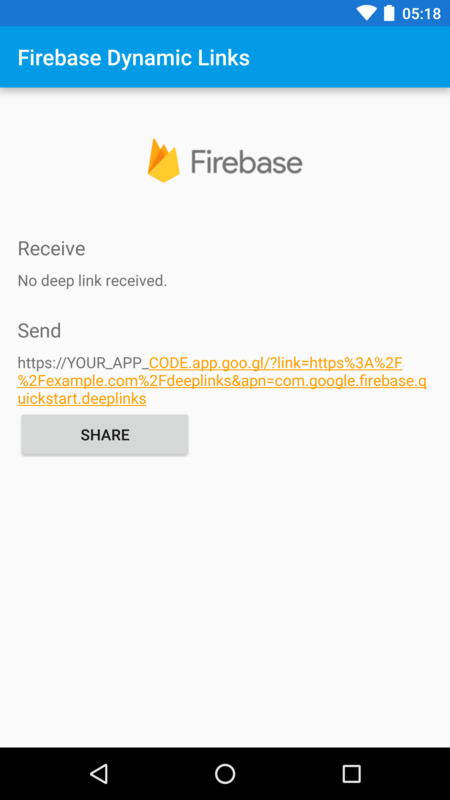 Try sharing the deep link from the application and use that deep link to re-launch the application.